Sunday, April 22 is Earth Day — a time to appreciate this beautiful planet and raise awareness about the ways we can protect and make it better it for generations to come. As it turns out, when it comes to real estate, upgrading a home to be more sustainable and earth-friendly isn’t just good for the environment, it also makes solid business sense. That’s according to a study released today by Seattle-based tech brokerage Redfin in honor of Earth Day. The research, which compared listings across the brokerage’s 80 metros with energy-efficient features versus those without, showed “green” homes sold for over $46,500 more on average in 2017 than homes without things like energy-efficient windows, appliances and solar panels. Three neighborhoods in the Cleveland suburb Shaker Heights made it into Redfin’s “Top 10 Neighborhoods For Green Homes” across the country. The city of Shaker Heights, which has its own climate change task force, offers a recycling program, as well as home energy assessments, energy incentive programs and the like, according to the study. Chestnut Hill and Spruce Hill in Philadelphia also fared well for its green homes, coming in at nos. 3 and 4, while three neighborhoods in Orange County ranked highly: Baker Ranch, Echo Ridge Village and Painted Trails. Red Hook, Brooklyn and Georgetown, Seattle were named in the top 10 at no. 5 and no. 8. While Earth Day is just one day, April 22 each year, there are things agents can do every day to help their clients take care of the environment in their communities, such as talking to them about composting, energy efficient lighting and drought-tolerant landscaping, said Natasha Barrett, an agent with The Agency in Los Angeles. Currently The Agency is helping environmentalist Denis Thomopoulos sell his small but relaxed, elegant three bedroom home in Venice, California. According to Thomopoulos, a home’s size is part of its sustainability. 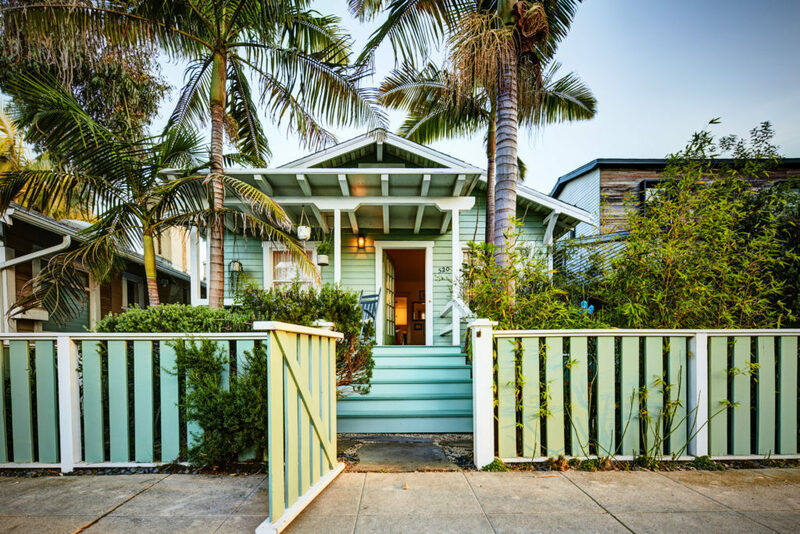 The environmental educator bought the 100-year-old house 20 years ago, and despite its popular location close to Venice Beach, was never tempted to knock it down and build a big property. “I am a conservationist, I decided to keep the best of the house and add certain elements,” Thomopoulos said. Part of The Agency agents’ commission from the sale of Thomopoulos’ house will go toward Thomopoulos’ environmental cartoon series Hippo Works. The seller will be donating 10 percent of the proceeds of the sale to a UN environment-related cause. In celebration of Earth Day, the L.A.-based luxury brokerage has partnered with Tesla to provide its energy-efficient cars for broker’s tours. It has arranged to have three to four Teslas available for L.A. agents to drive in for a broker caravan on Tuesday that will end at an eco-friendly luxury listing featuring 36,000 pounds of concrete panels as well as energy-efficient insulation air pockets between the panels and house. Moreover, last month real estate industry leaders came together to draft the Parker Principles, a code of commitment for changing the industry together. One of the principles is “Stand up to climate change and prepare for natural disasters,” an especially poignant idea on the heels of a devastating year plagued by hurricanes and wildfires. “As an agent or homeowner, you may already be familiar with aspects of the New Energy Economy such as smart thermostats, LED lighting, and solar panels, for example. The cost for these technologies has been dropping even while features have gotten better and better. On the horizon we have the mass production of electric cars and cheap battery storage, which when combined with solar power, make the home its own mini power plant. “No more trips to the gas station, no more bills from the power company — this is the not-so-distant future,” she said.